The acclaimed actress and author of Jesse: A Mother’s Story tells the story of her outspoken, frequently outrageous Italian immigrant mother. Marianne Leone’s Ma is in many senses a larger-than-life character, one who might be capable, even from the afterlife, of shattering expectations. Born on a farm in Italy, Linda finds her way to the United States under dark circumstances, having escaped a forced marriage to a much older man, and marries a good Italian boy. She never has full command of English, especially when questioned by authorities, and when she is suddenly widowed with three young children, she has few options. To her daughter’s horror and misery, she becomes the school lunch lady. Ma Speaks Up is a record of growing up on the wrong side of the tracks, with the wrong family, in the wrong religion. Though Marianne’s girlhood is flooded with shame, it’s equally packed with adventure, love, great cooking, and, above all, humor. The extremely premature birth of Marianne’s beloved son, Jesse, bonds mother and daughter in ways she couldn’t have imagined. The stories she tells will speak to anyone who has struggled with outsider status in any form and, of course, to mothers and their blemished, cherished girls. 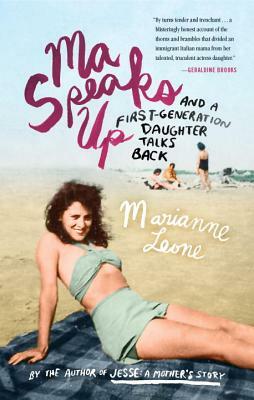 Marianne Leone is an actress, screenwriter and essayist. Her essays have appeared in the Boston Globe, Post Road, Bark Magazine, Coastal Living and WBUR’s Cognoscenti blog. Her memoir, Jesse: A Mother’s Story of Grief, Grace, and Everyday Bliss, was published by Simon & Schuster in 2010. Leone had a recurring role on HBO’s hit show, “The Sopranos” as Joanne Moltisanti, Christopher’s mother. She has also appeared in films by David O. Russell, Larry David, John Sayles, and Martin Scorsese. She is married to the award-winning actor Chris Cooper.